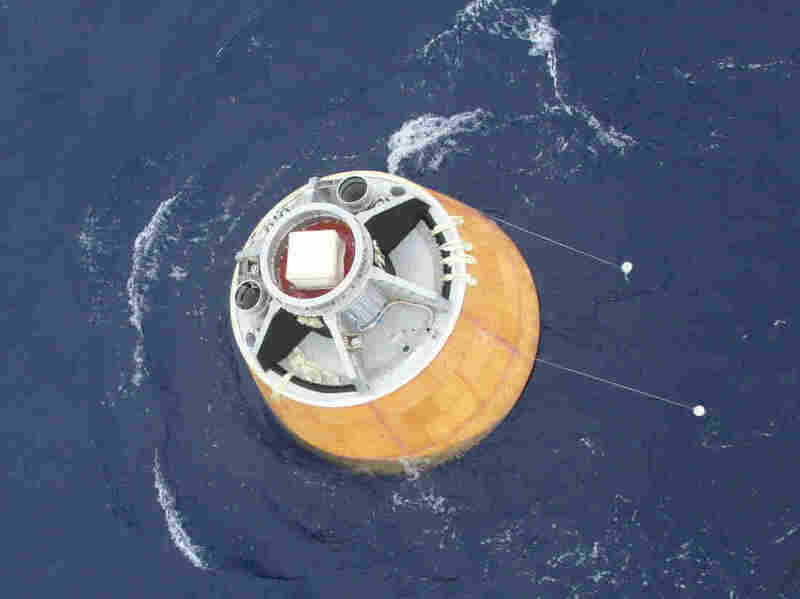 India Tests Crew Capsule, New Heavy-Lift Rocket : The Two-Way An improved version of India's largest space-launch vehicle carried an unmanned crew capsule that was recovered after splashdown in the Andaman Sea. India's test crew module floating in the Andaman Sea after splash down. India took a giant leap forward toward its ambitious goal of sending humans into space, launching an unmanned crew capsule aboard a powerful new rocket. The Indian Space Research Organization, or ISRO, launched the 630-ton rocket from its facility at Sriharikota on the country's southeast coast. It was the first flight test of an improved version of the Geosynchronous Satellite Launch Vehicle, or GSLV rocket. Spaceflight Now reports: "It can carry up to 10 metric tons, or about 22,000 pounds, of cargo into low Earth orbit and up to 4 metric tons — 8,800 pounds — into geostationary transfer orbit once it is operational, a milestone Indian officials hope to achieve within about two years." Atop the rocket was the Crew Module Atmospheric Reentry Experiment, or CARE, a test version of a manned vehicle that India has been developing to carry two or more astronauts into space. In a statement on its website, ISRO said: "The mission began with the launch of GSLV Mk-III at 9:30 am [Indian Standard Time] from the Second Launch Pad as scheduled and about five and a half minutes later, carried its payload - the 3775 kg Crew Module Atmospheric Re-entry Experiment (CARE) - to the intended height of 126 km. Following this, CARE separated from the upper stage of GSLV Mk-III and re-entered the atmosphere and safely landed over Bay of Bengal with the help of its parachutes about 20 minutes 43 seconds after lift-off." K. Radhakrishnan, ISRO's chairman, called the mission a "very significant day in India's space history." Although in 2003, China became the third nation — after Soviet Russia and the U.S. — to put humans in space, India beat its Asian rival earlier this year in placing a probe in orbit around Mars. It did so at a fraction of the cost of a similar U.S. Mars mission. But The Associated Press notes that "experts say it will be several years before India can send astronauts into space." The AP writes: "India, which is striving to become a player in the multi-billion dollar space market, has successfully launched lighter satellites in recent years, but has faced problems sending up heavier payloads."